Adapted from the book The Japanese American Community of the Monterey Peninsula by David T. Yamada and the Oral History Committee of the Japanese American Citizens League of the Monterey Peninsula, used with permission from the publisher. Edited by Wendy Ng, San Jose State University. Many people are familiar with the larger Japanese American communities of San Francisco, San Jose and Los Angeles. However, before World War II, there were many small Japanese American communities scattered throughout the West. A majority of these communities were located in rural farm towns in California, Washington, Oregon, and Arizona. This is the story of one such community on the Monterey Peninsula. Carmel and Monterey are known today as oceanside resorts. They are places where tourists enjoy trendy art galleries and boutiques, a world-class aquarium, and the famous Pebble Beach golf course. Decades before Clint Eastwood became the area's first celebrity mayor, the Monterey Peninsula was made up of small towns called Monterey Outer City, Del Monte Grove, Monterey Township, and Pacific Grove. In the late 1890s, several Issei immigrants settled in the region and by 1900, had established a thriving community made up of thirty-eight families. The 1900 U.S. Census listed their occupations as "wood chopper, farmer, farm laborer, fisherman, whaler, and student." Why did these families choose the Monterey region, rather than remaining in the larger Japanese American settlements of the Santa Clara Valley? 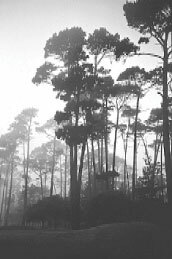 It is said that the rugged beauty of the rocky cliffs, pine, and cypress surrounding Point Lobos and the Pebble Beach shoreline reminded the Issei of Japan. This is a photo of Monterey in 1972, before the development of the waterfront began. It would have looked something like this when the Japanese first arrived in the late 1890's. National Archives. Point Lobos today, looking much like it did in the 1890's. National Archives. Around 1900, there was an economic boom in Monterey. Fisherman's Wharf #1 was built and the Hotel Del Monte opened, drawing wealthy tourists. The Southern Pacific Railroad replaced the old narrow gauge railroad tracks and built a standard gauge railway line into Monterey—finally making the region accessible. In the1890s, paved roads were built along the historic 17-Mile Drive. The dramatic coastline drew newfangled automobiles that soon outnumbered the horses and wagons. All of these improvements meshed economically with the farming, fishing, and service-related businesses of the Issei. In 1897, immigrant Gennosuke Kodani, trained in the Japanese abalone industry, arrived on the Monterey Peninsula. Kodani's practiced eye located several prime abalone fishing areas on the rocky coastline. 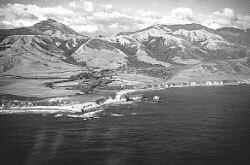 Shortly after he arrived, Kodani partnered with Alexander M. Allan—who provided the capital and helped to purchase the land where Kodani started the Point Lobos Canning Company. He recruited several abalone divers to come to America from his home area of Chiba, Japan. Together with his divers, Kodani revolutionalized the abalone industry by adapting the helmet diving method to the chilly waters off Point Lobos. They used the hard helmet, an improved insulated suit, and a hand pump for air, to allow divers to stay submerged longer and more safely and efficiently. Some of Kodani's original divers and other recently immigrated Issei eventually went into new partnerships and formed their own abalone fishing businesses. There was a high demand for abalone, which could be canned, dried, or sold fresh, and it was popular in Asia and the east coast of the United States. Over time, several of the Issei saved enough to buy their own gear and small boats. Other fisherman soon copied the more efficient Japanese way of abalone fishing and the industry took off. In fact, there was so much abalone available in those days that the large nine to ten inch shells were stacked in huge mountains at the north end of Alvarado Street in Monterey. There was little commercial value for the shells until World War II when some clever entrepreneurs trucked them away to commercial sources to make into buttons and jewelry. Other shells ended being ground up and put into landscaping material or sand for the beach. Gennosuke Kodani, eventually went back to Japan to marry. Together, he and his wife Fuku, returned to Monterey in 1903. They raised nine children and built Kodani Village at Whaler's Cove. The Village consisted of the family home, bunkhouse, guesthouse and ranch outbuildings. For over thirty years, Gennosuke Kodani ran the abalone business and provided employment, money and housing for many other Issei immigrants and their families. This field was typical of the plantable land in the Monterey region, not the salt grasses. National Archives. There was already a thriving fishing community in the Monterey region by the time the Issei immigrants began arriving. Since many Issei came from areas in Japan where fishing was a common occupation, it was only natural that they found work as deckhands or in the fish canning businesses on the wharf. In fact, by the 1930s, a large segment of the Japanese American population was working in fish processing. (For a longer, in depth discussion of the Japanese Americans in the fishing and fish processing industries, read the chapter "I Wanted to Be a Baseball Player" by historian and archivist Tim Thomas of the Maritime Museum of Monterey). Though the Monterey Peninsula is primarily known for its coastal resources, the surrounding land and climate also make it a favorable place for farming. 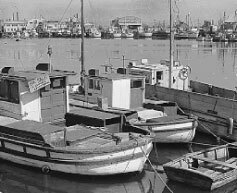 Some Issei immigrants, including those that moved down to the Monterey region from the Santa Clara Valley, were not interested in the fish business. Instead they turned to truck farming. Most of these family-run farms were between five to thirty acres, and were a mixture of both prime and marginal lands. A few families, like those in other regions of California, were able to purchase land before the alien land laws were enacted, but the majority rented or sharecropped their farms. The new railway and improved roads opened up much bigger markets for the produce grown around Monterey. The early pioneer farmers in the Carmel region grew potatoes (which thrived in the climate) and a large variety of vegetables. Unfortunately for fields too close to the Carmel River, constant flooding washed out the crops. Today, farmers can hire a backhoe to open the sandbars to prevent water destined for the ocean from backing up into the fields. However, up until the late 1930s, flood prevention meant hitching up horses and a plow to laboriously cut open the sandbars. By the 1920s, some Issei had decided to quit farming. They felt the work was backbreaking and the climate was too unpredictable. These men turned to gardening or landscaping the grounds of the churches, homes of the wealthy, and the hotels. It was the production of the Model T Ford and later the Ford trucks that allowed the Japanese to drive out to the palatial estates in Pebble Beach to work. Fishermen also augmented their income in the off-season with landscape jobs and by the time of the Great Depression, almost all gardeners and landscape workers in the Monterey region were Japanese. Some of the Issei and their Nisei children in front of the Japanese Association Hall that they helped raise funds to build. The Hall is still standing and still in use by the community as an Asian arts center. Larry Oda collection. Soon after the Issei immigrants arrived on the Peninsula, ethnic community organizations emerged. One of the earliest was the Nihonjinkai (Japanese Association). It served as a cultural and social organization for the Issei families. Eventually, Issei who had opened small businesses (grocery and dry goods, shoe repair, laundry, restaurants, diving and fishing equipment repair) also joined the Nihonjinkai. In 1925, this group decided to build the Japanese Association Hall so that the families scattered across the Monterey Peninsula would have a place to meet. The Hall, completed in 1926 with money donated by the Japanese American community, was located in the heart of the small Japantown in the city of Monterey. It was used for meetings, classes, lectures, theatrical and cultural events. There was a Japanese language school, a Buddhist church was built in 1965, and eventually the Japanese Church of Christ was built nearby. The Japanese American Citizens League of the Monterey Peninsula (JACL) was formed in 1932 two years after the national JACL had received its charter. This organization grew out of a community group that helped the Issei with the English language, and provided immigration, tax and contract information. At the start of World War II, the Issei leaders transferred the deed of ownership to the Monterey JACL &#nbsp; to ensure that the building, which still stands and is now known as the JACL Hall, would always remain in the Japanese Community. The JACL has been a driving force for over 75 years, sponsoring sports and educational activities, health care and social programs, and addressing civil liberties and civil rights, including the redress movement. Other community groups over the years include the Minato Athletic Club, which sponsored baseball and basketball leagues for both boys and girls as well as track and field teams; the Monterey Fishing Club, founded in the 1950's for sports fishing enthusiasts; Veterans of Foreign Wars (VFW) Post #1629, the Nisei Bowling League, and the Issei-Kai, formed in 1974 to provide senior activities for the now elderly Issei. Boats for sale as the evacuation was looming. National Archives. After December 7, 1941, the Japanese American fisherman was not allowed by the U.S. government, to go to sea again until the coast was reopened in 1945. Other Japanese who worked at the Wharf or dove for abalone were also suspect. Businesses, such as fuel and fishing supplies, or those that sold clothing and groceries that depended on the Japanese Americans soon felt the repercussions. Without the additional fish and abalone brought in by Japanese Americans, canneries and fish processing companies soon felt the economic hardships that eventually spread across the entire Monterey Peninsula. Similar to San Jose and surrounding regions, the war permanently altered the Japanese American community of Monterey, both socially and economically. After the war, many families returned to the Monterey Peninsula but some eventually relocated to other parts of the country. Others, who had met the Monterey families in camp, decided to come to the area to start over. Few Japanese Americans had the capital to begin large-scale fishing or farming again. For the majority of them, the only jobs available were in the sardine canneries, or as laborers. During the mid 1930s to 1940s, fish stocks began to fall in the Monterey region — depleted by the newer types of trawlers and equipment. 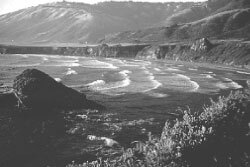 After the war, there was still some abalone diving and processing but slowly through the 1950's and 60's, even that disappeared. By the 1970s, one fisherman after another quit the business and the canneries closed. Fisherman's Wharf was rebuilt as a tourist attraction. Today, the Japanese American Community of Monterey is much smaller than the heydays of the 1930s. Many of the old businesses are no longer in existence or are owned by non-Japanese. The Japanese settlement is gone, though the old white clapboard Hall built by the Issei still remains a cultural anchor of the community. This historic old structure saw duty as a California National Guard Armory during World War II and this probably saved it from vandalism and destruction. After the war, it served as a hostel for many returning families. Currently, after it was extensively refurbished in the 1980s, the Hall is used as an Asian Cultural Center. The JACL holds a Japanese language school and rents space to various groups for Chinese Language, music, traditional Japanese dance and martial arts. In recent years, the Nisei and now the Sansei generations have worked hard to preserve the stories of the past and the legacy of the Issei pioneers. The Maritime Museum has a display about the Japanese American women who worked in the sardine canneries, and is now planning an exhibit about the Japanese American fisherman, including a large scale re-creation of the Manaka family's last boat before the evacuation, the OHIO. There are also plans to open a community based Japanese American museum. The JACL has recorded many oral histories, some published in The Japanese of the Monterey Peninsula. According to editor David Yamada, "As time passes, buildings crumble, people age, and memories fade. We begin to forget the name or location of a house or business so it is important to capture an experience as accurately as possible, while we still can, in order to preserve for the future what is treasured from the past." The Sea Pride cannery, the only Japanese American fish packing plant in Monterey, owned by the Oda family and their business partners. Larry Oda Collection A newspaper ad from 1945, with 500 signatures, welcoming the Japanese Americans back to the Monterey region. National Archives. Soentpiet, Chris K. 1998, So Far From the Sea, Clarion Books, ISBN: 0395720958, Reading level 4th grade and up. Laura Iwasaki and her family visits Manzanar in 1972 before their upcoming move to Boston. Her grandfather, a fisherman who loved the sea, was buried at Manzanar. This book is a retelling of the family's experiences in internment camp. Clovis, Margaret (2006) Monterey's North Coast and Coastal Valleys, Images of America series, Arcadia Press, ISBN: 073854677. This book is a pictorial history of the region from the 1880s to about 1990. Available at Amazon.com. Lydon, Sandy (1997) The Japanese in the Monterey Bay Region: A Brief History, Capitola Books, ISBN: 093231905X. Available from Amazon.com. Thomas, Tim (2006) Monterey's Waterfront Images of America series, Arcadia Press, ISBN: 0738530034. This is a pictorial history of Monterey's historic waterfront from the late 1800s, through the 1980s. Tim Thomas is the head archivist at the Monterey Maritime Museum. Available from Amazon.com. Yamada, David (1995) The Japanese of the Monterey Peninsula: Their History & Legacy 1895-1995,The Monterey Peninsula Japanese American Citizens League of the Monterey Peninsula. This is a beautifully illustrated pictorial history with many never before published photos of Japanese American families and the community. There are several stunning photos of the fishing industry and Frank Manaka and his boat, Western Explorer. Available from the JACL of the Monterey Peninsula, P.O. Box 664, Monterey, CA 93942-0664. National Archives www.archives.gov/research/japanese-americans/ This on-line area is specific to the Japanese American experience during World War II. 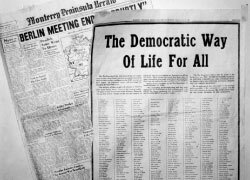 Included are many links to a database listing the names of most of the internees (based on 1940's records), Nisei military records, and twenty days of Congressional testimony which eventually led to the Civil Liberties Act of 1988.